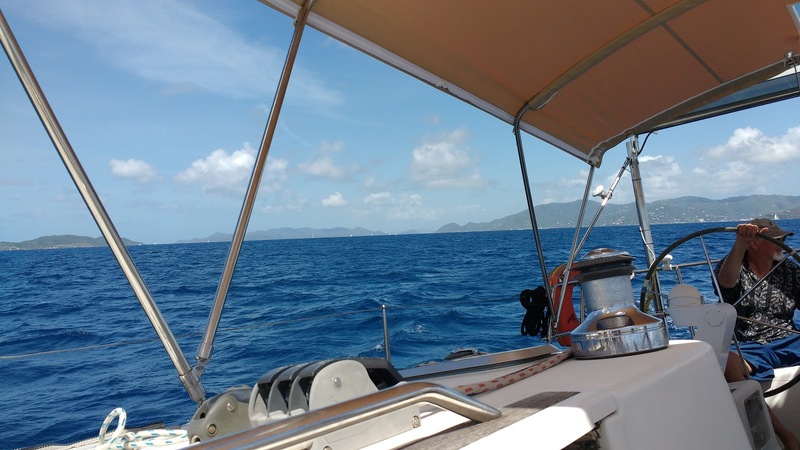 Motor sailing from Puerto Rico to USVI and back to BVI. The sail is up to help stabilize the boat and provide some power, but the motor is on because we are traveling too much directly into the wind to get where we want to go in a reasonable amount of time. 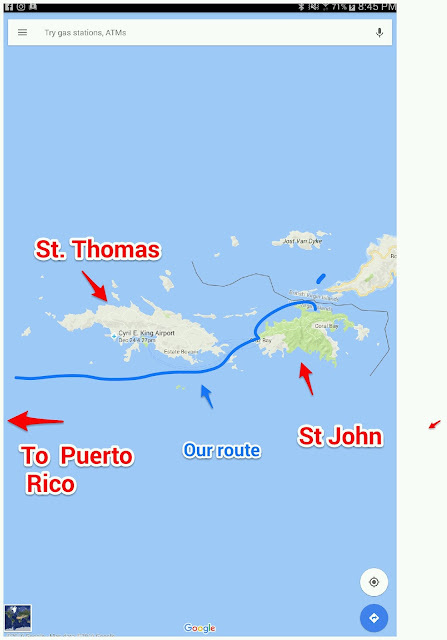 As we sail the length of St. Thomas USVI, and round the corner into the passage that leads to the BVI there is a considerable increase in traffic. Sailboats, large and small, powerboats and ferries. We passed quite a few day sailors, commercial boats full of people out for the day. Catamarans and monohulls alike. You can spot these boats by the sheer number of people on them, many more than could ever even be spending one night on the boat. All these boats make it necessary to be much more alert. Just what path is that boat taking? This is not the place to assert your right of way, just get out of the way and watch for the next boat approaching. We took a short break for lunch and grabbed a mooring ball on St John USVI. The nice thing about mooring balls, even those that charge a fee, is that they are all free during the day. You can pull up to any of them, hang out for a while, and then move on. Upon pulling in, I put on swimsuit and jumped in the beautiful clear water. After showering and toweling off , I went down below to close my eyes and rest a few minutes on MY bed. This is my home, and I love it! Yes, we can take showers. We can carry 180 gallons. Our hope in the not too distant future is to have a reverse osmosis water maker, then we can have as much water as we can produce. Out of the Marina at Last!